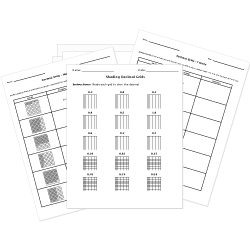 Our collection of decimals worksheets is designed to improve student confidence and skill with reading, writing, and comparing decimals as well as computing fluently with them. Don't see a printable you need? Use our Test Maker™ to create your own printable that fits your needs. Browse decimals questions or use our advanced search to find existing questions while filtering by grade levels and keywords. Decimals in Words - Tenths new! Converting Rational Numbers to Decimals new! Rounding Decimals to Whole Numbers new!